The Baby Jade or Portulacaria afra, also known as Dwarf Jade Plant, Elephant's Food, and Elephant Bush, is a small-leaved succulent found in South Africa. It is a soft-wooded, semi-evergreen upright shrub or small tree. Similar in appearance to the Jade Plant ( Crassula argentea), but has smaller and rounder pads and more compact growth. It is much hardier, faster growing, more loosely branched, and has more limber tapering branches than Crassula. The fleshy trunk, branches, and leaves are used to store water. An excellent bonsai tree for the home or office. 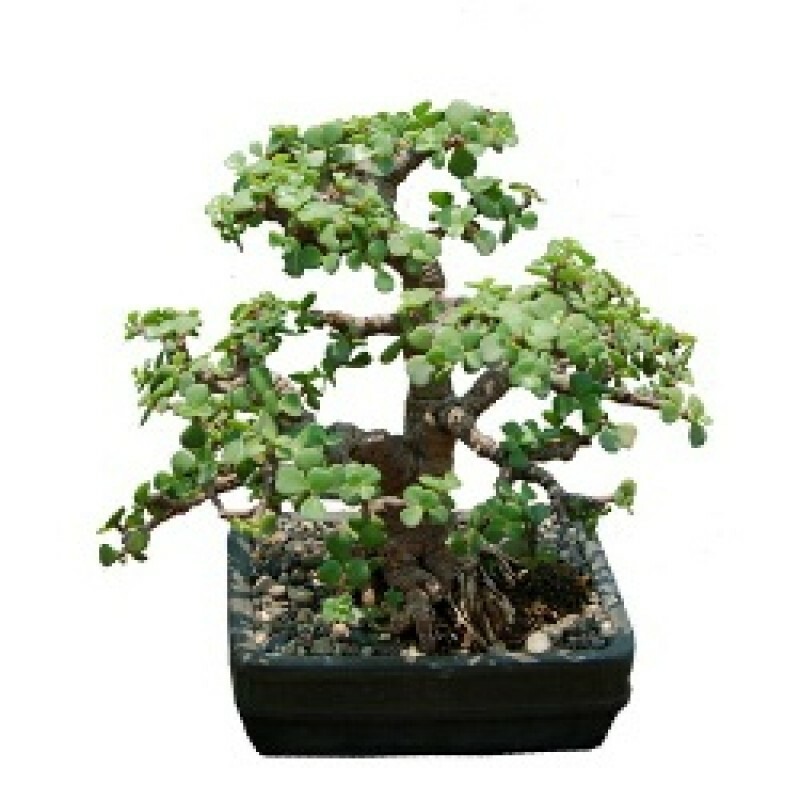 The Jade tree is considered an indoor tree in most temperate zones, although it can be grown outdoors in full sun (and sufficiently high temperatures). Keep temperatures above 5 degrees C (or 41F) at all times. It needs lots of light or even full sun. Jade trees can hold large amounts of water inside their leaves. Water sparsely and allow the plant to dry out a little bit between watering. During winter time watering can be as seldom as once every three weeks. The Jade is not as particular about over-watering as most other succulents. Once a month during the growth season (spring-autumn). As a succulent, water is contained its trunk and branches; they tend to bend from their weight. Jades respond well to pruning, which should be done regularly to force the tree to grow branches also lower on its trunk. Do not use cut-paste though, as this might lead to rotting. Repotting: Repot the three every second year in spring, using a very well-draining soil mixture. Propagation: Easy to propagate using cuttings during the summer. plants height with pot is 1.5 feet and pot size is 8 icnhes diameter oval shape.